Dragon has launched a new 1/35 scale kit of a Jagdpanther Early-Production tank destroyer. 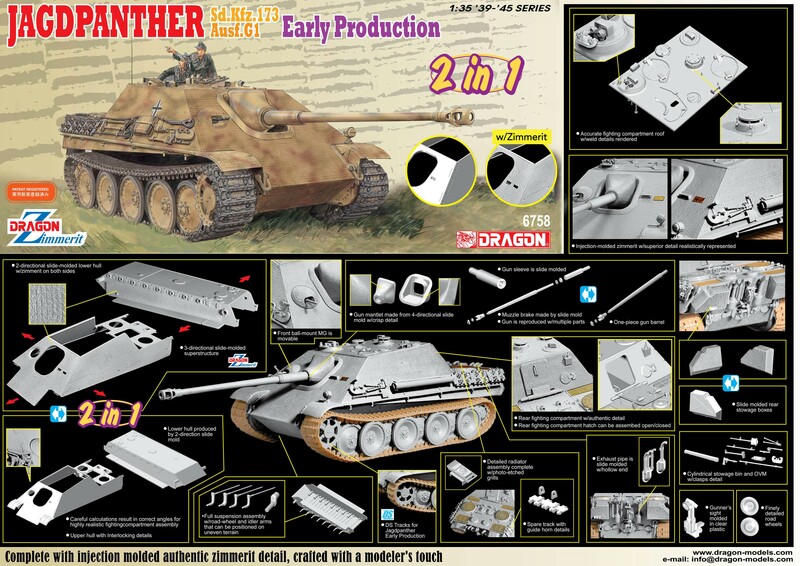 What sets this one apart from previous early Jagdpanther kits is that it’s a 2-in-1 kit. This means that modelers can choose to build their armored fighting vehicle either with or without the distinctive Zimmerit coating consisting of small squares. This choice is a big deal, because the box contains no fewer than two complete lower hulls, two fighting compartments and all sorts of other parts. Everything necessary for a coated or uncoated early Jagdpanther is provided here. Of course, the characteristic Zimmerit texture is beautifully recreated, saving modelers the dreary task of having to add this to the kit themselves. This 1/35 scale Jagdpanther, bristling with sensational levels of detail, offers brilliant value to modelers.